The Nigerian first lady, Patience Dame Jonathan is on a campaining tour for PDP presidential candidate and husband Goodluck Ebele Jonathan. During her campaign in Calabar, while she was being encouraged by are ardent supporters such as Onyeka Onwenu and Kema Chikwe, she told her supporters to stone anyone that talks about ‘Change’. Change is the slogan of the opposition All Progressives Congress. Meanwhile this statement has spurred various reactions from Nigerians who believe that the office of the first lady in an honorable one which should have no room to for careless statement. This stamen also poses a security threat to the members of the APC and there supporters especially in view of the several attacks on APC supporters in her hometown of Okrika, in Rivers state. 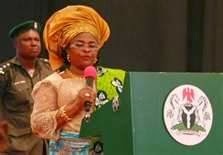 Yesterday it was also reported that she called the APC presidential candidate”brain dead”.